Do you ever have a powered window not work all of the sudden? It may go down but it refuses to go back up? 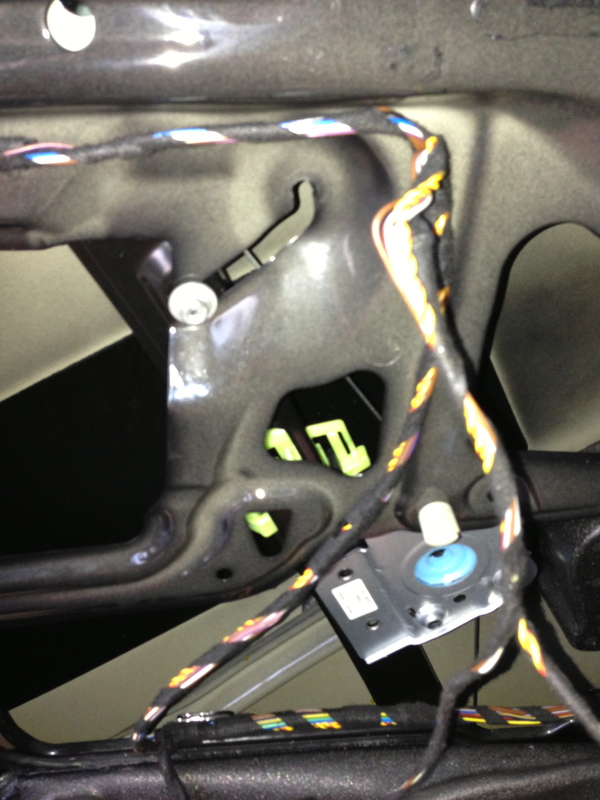 If you press on the button and still hear an audible whirring sound but no movement of the window, your motor might still be intact but the window regulator might be bad. In my case both of my rear window regulators in my E90 went bad within minutes of each other (I suspect due to a recent trip to the carwash.) The windows could still be rolled down, but once they were down they won’t go back up. At the instant the window didn’t roll back up, my car threw an “anti-trap” error. After reading the forums about how much it would cost to get the dealer to fix this issue, I decided to look into fixing it myself. 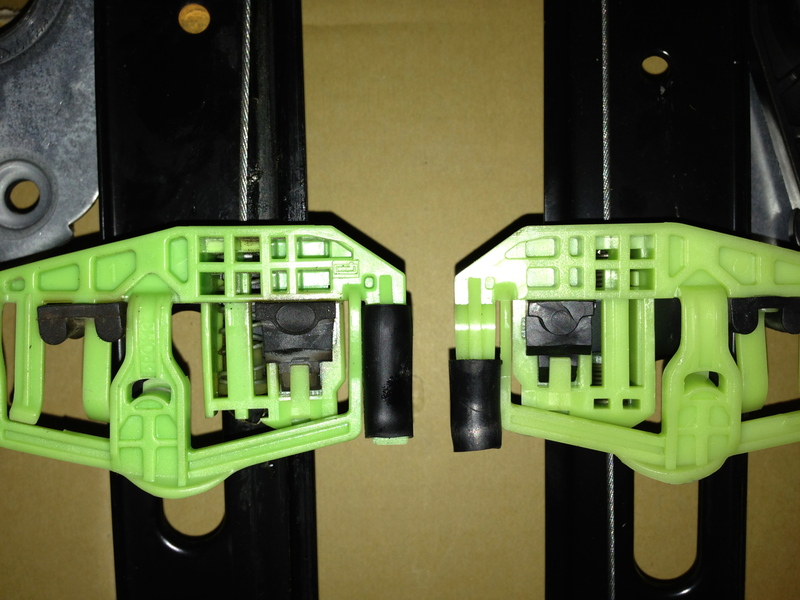 The window regulator is essentially a pulley system that transfers the rotary motion of the window motor and shuttles the glass holder (green plastic) up and down. 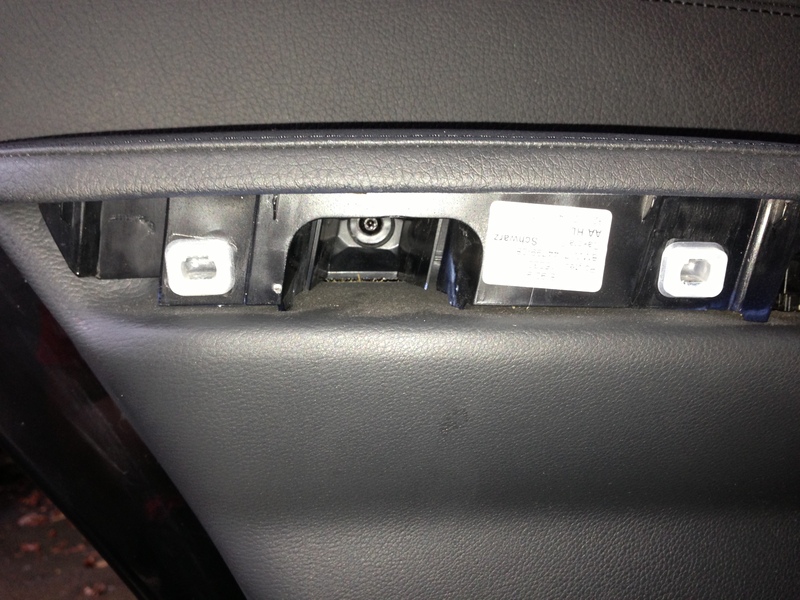 The above picture shows a broken and a new window regulators (left is the broken passenger and the new driver side regulator is on the right.) 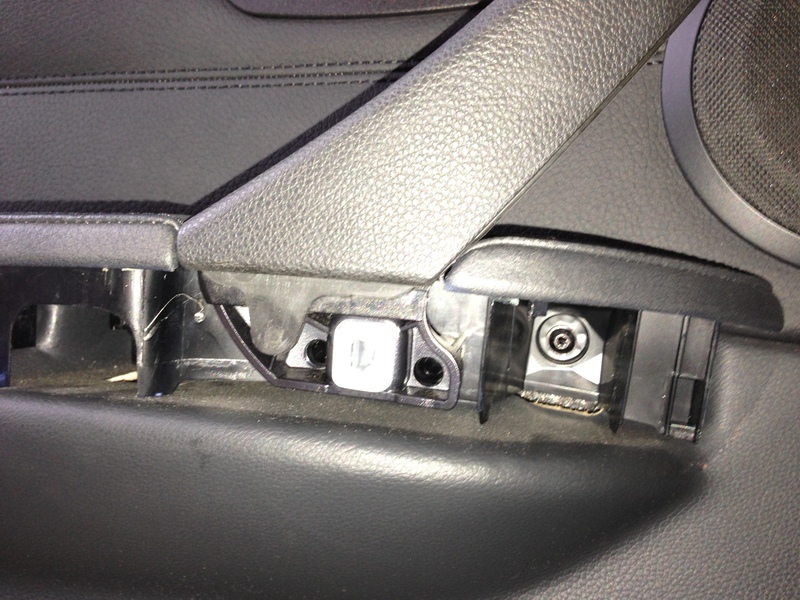 The reason that the window can no longer go up under power is because the portion of the glass holder has cracked and no longer provides tension to the pulley system. WARNING: If you’re not mechanically inclined, leave this work to a professional because you may risk breaking glass/puncturing upholstery/severing wires/hurt yourself. This is a straightforward process but consider yourself warned. 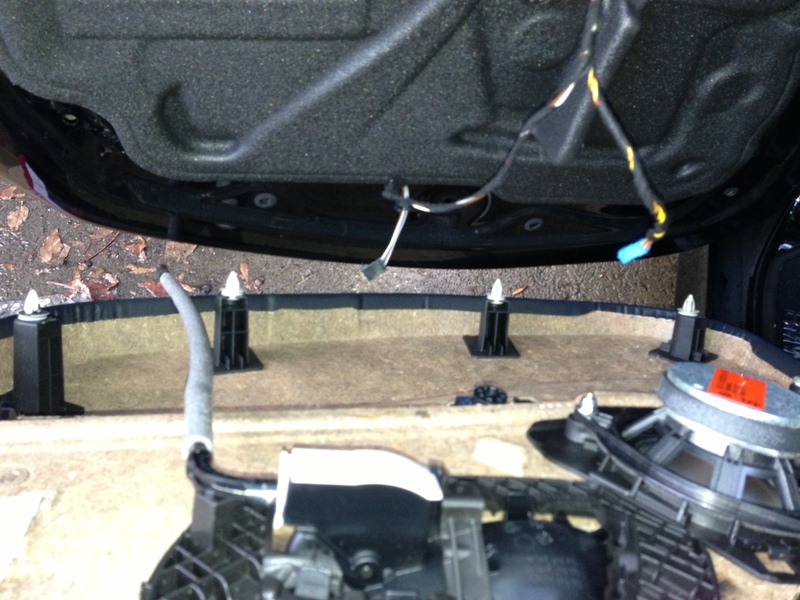 I suspect that this process is similar for other cars but the steps below are for replacing the rear driver’s side window regulator on a BMW E90 platform. 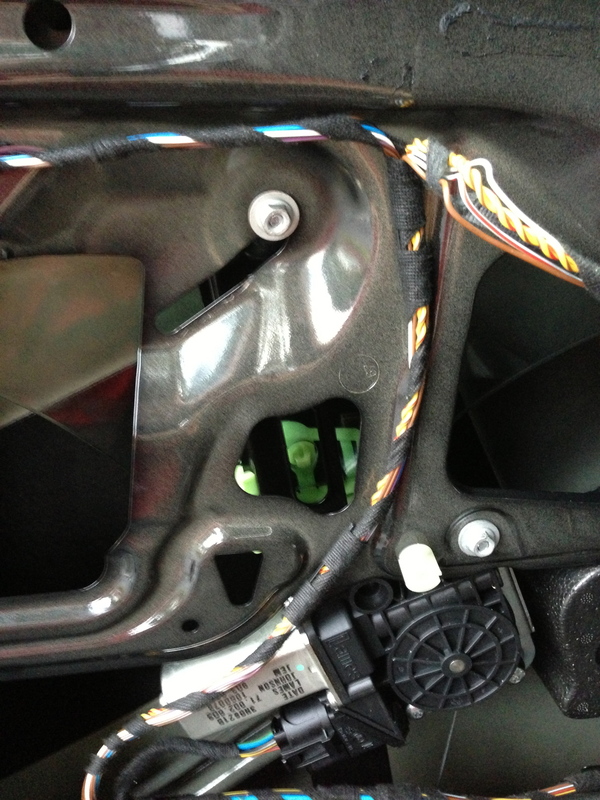 First you’d have to remove the trim pieces that usually covers the major fasteners. This is where having a plastic prying tool comes in handy, once you get some leverage apply even pressure throughout the trim piece and it should pop off. 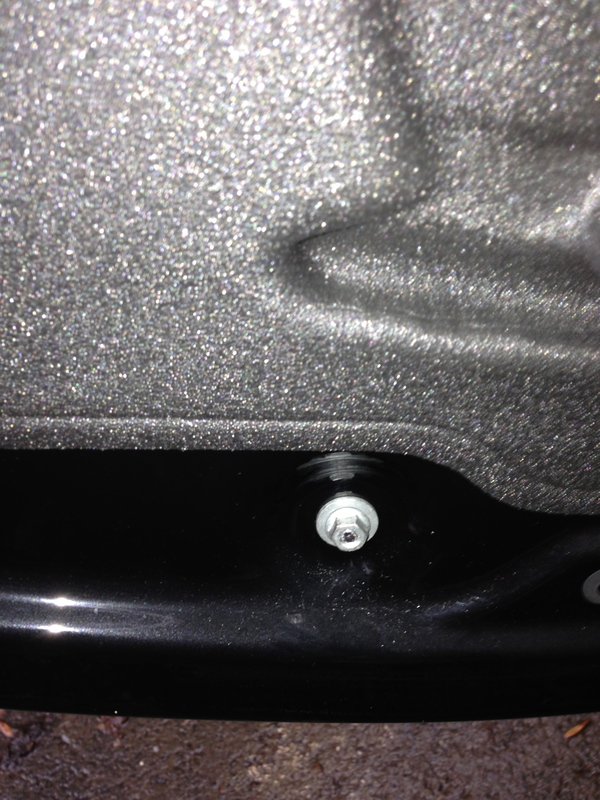 Once all three torx screws are gone the door is now held on by plastic ribbed rivets and clips. 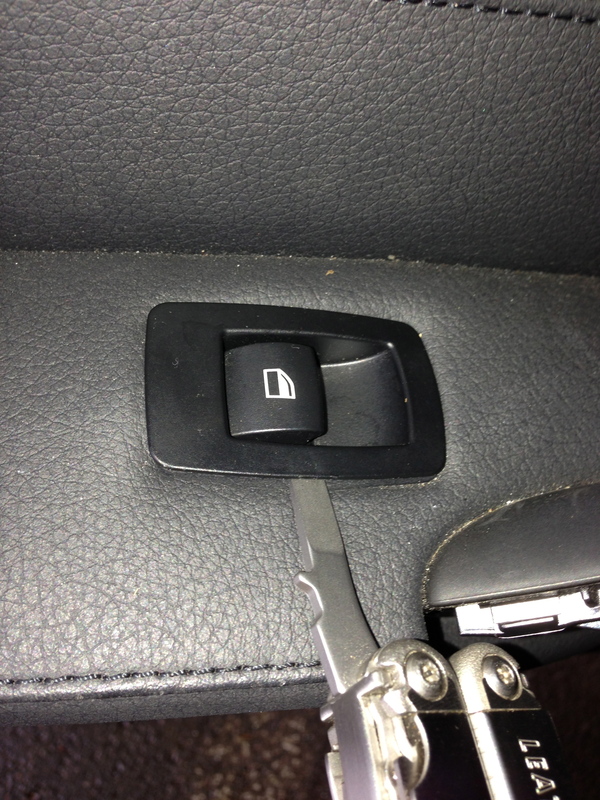 Before you pop off the door panel it’s best to first disconnect the window button switch from the wires behind the panel. 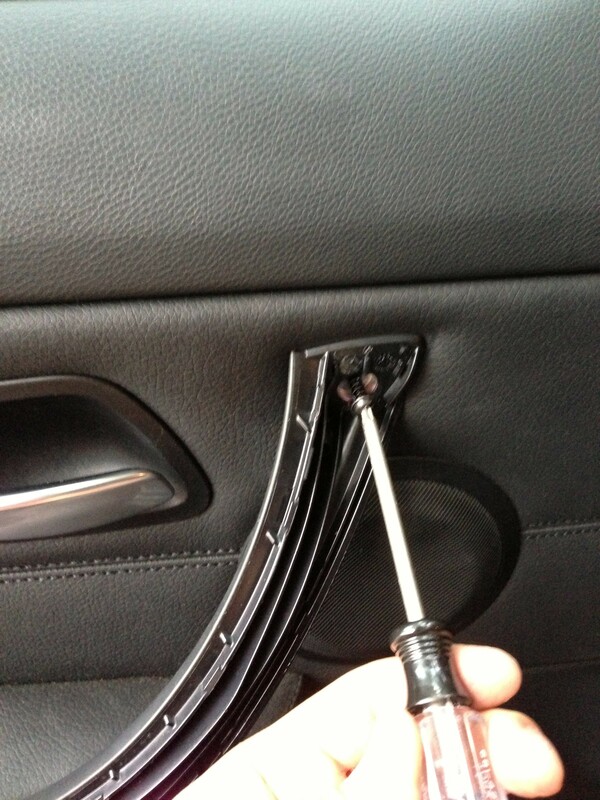 To do this you’d need to use the pry tool again and you have to be careful not to scratch or tear the upholstery as you go about doing this. Once you have disconnected the two connections the door panel can be placed somewhere safe and you can proceed to remove the door’s sound insulation. The sound insulation is foam padding secured to the panel via some gooey acoustical sealant. Separating this insulation will be the weirdest step in this whole process because it feels irreversible and you may feel like it may ruin your car, though if you are careful you won’t end up ripping the insulation and you may be able to reuse the sealant. Also note that if you get this sealant under your fingernails it will be extremely difficult to clean. Now that the insulation has been folded out of the way you can now see the motor and the window regulator that it is mounted on. 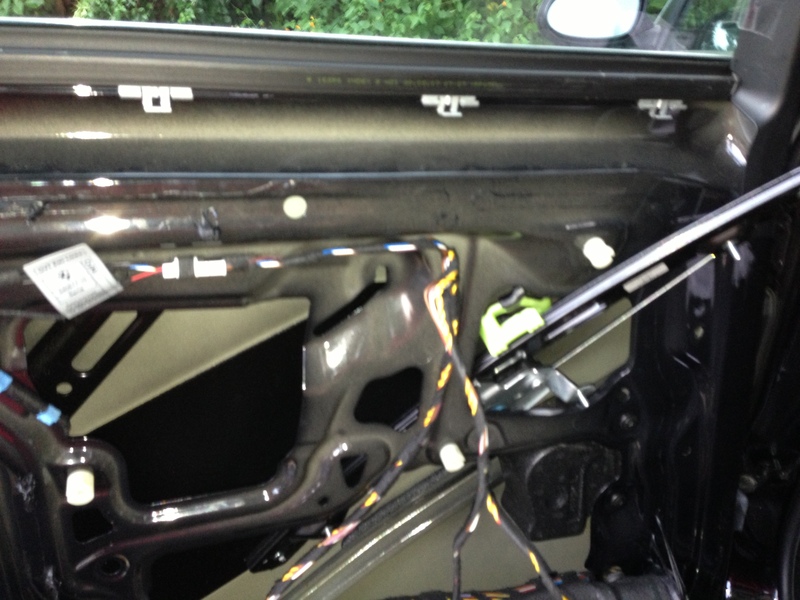 To get access to the regulator you first need to remove the three nuts that secures the window regulator to the door. One on the bottom and two in the middle of the door frame. You’ll need the 10mm socket wrench on these nuts. 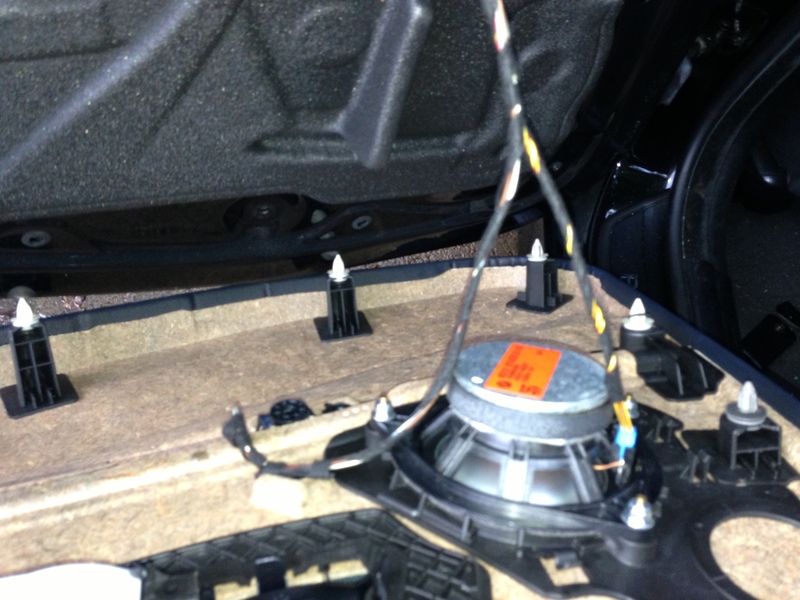 At this point you will also need to remove the motor from the window regulator. There should be three screws and you can loosen these with your torx driver. Once the motor is out of the way and the regulator loosened from the door, you can release the glass from the glass holder. 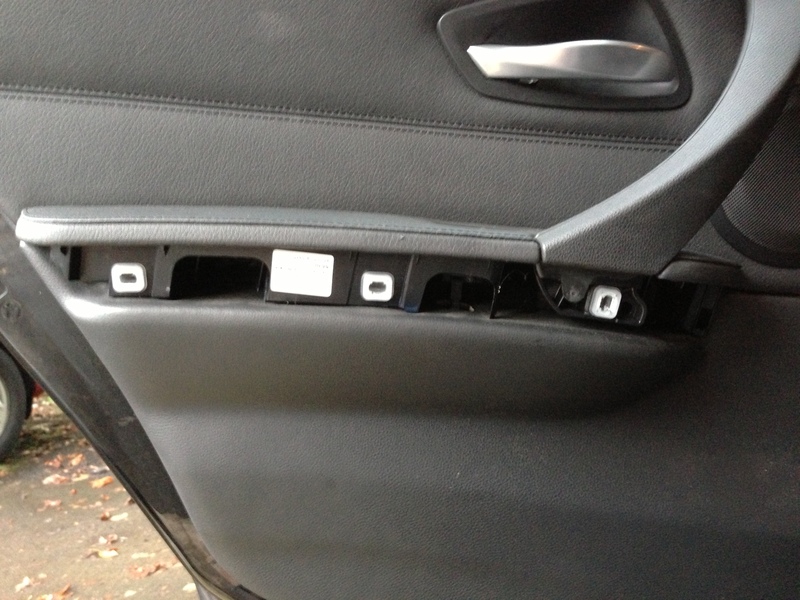 There will be a hole cutout in the glass in which the glass holder latches on to. Pushing on this latch will allow you to separate the glass from the regulator, BE CAREFUL HERE, for you can break the glass if you’re not. Once the glass is separated push it up all the way and secure it via packing or duct tape to the rest of the door so that it doesn’t accidentally slide down. 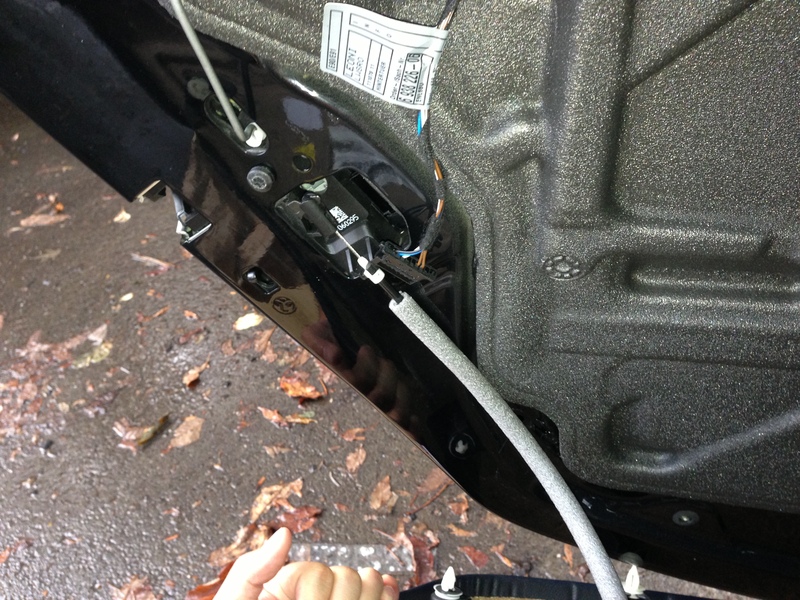 Note that at this point if you don’t have the replacement window regulator on hand to finish the job you can at least have your window closed and the car’s interior protected from rain. 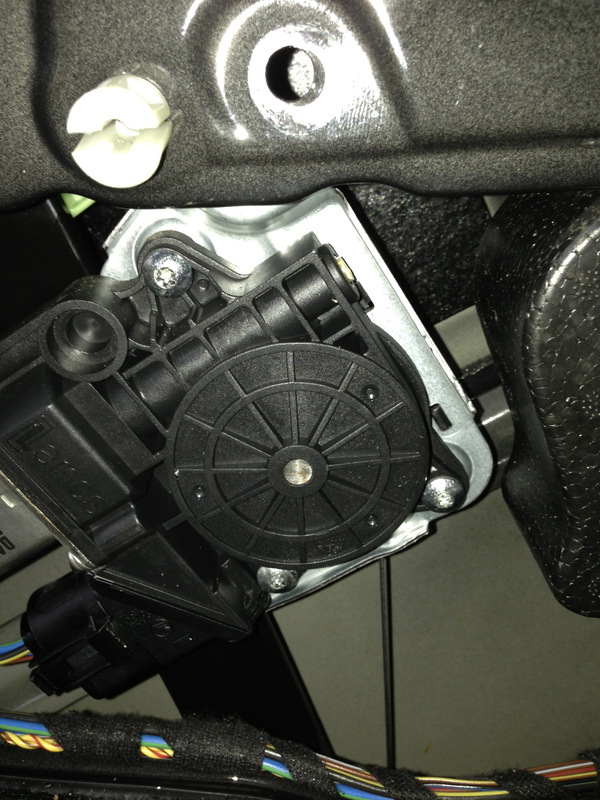 You can now take out the old window regulator and replace it with the new unit. To ease the installation of the new unit, you need to first mount the motor to the regulator reusing the three torx screws. Once the motor is secured you can mount the regulator to the door by aligning the three screws on the regulator to the holes in the door frame. Place the three 10mm nuts and loosely tighten them to prevent the regulator from shifting too much as you replace the glass on the green plastic component. To mount the glass on the glass holder firmly press down on top of the glass and firmly press up on the holder so that the two components click together. 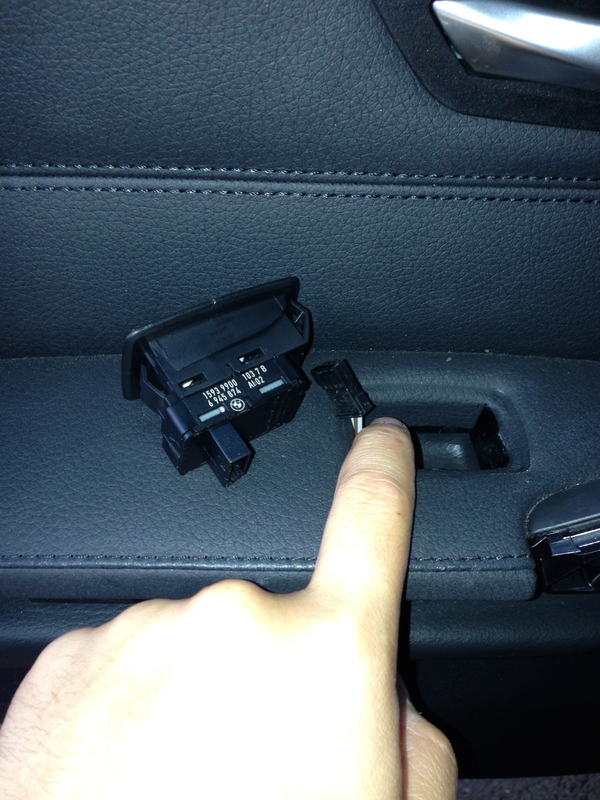 The latch of the plastic holder should sit in the hole in the bottom of the glass. Once the glass is secured and all the bolts tightened it is best to try the new window regulator before you close everything up. At this point the car had to reprogram the window because it no longer knows when it has completely closed or when it is completely open. Before reprogramming the window would only go up or down in small increments. Reprogramming the window in the E90 BMW is somewhat of a voodoo practice. Some people in the forums have stated that once the window is all the way down, to hold the window switch down for exactly 17 (or 20) seconds and to immediately pull up on the switch. Also, you have to do this on the switch where the window is faulty. I did exactly this. I sat in the rear driver side seat (the side I have been working on) and held down the switch for 17 seconds and immediately pulled up. Nothing happened. I did it a couple more times to no avail, the window kept on going up or down in small increments. Frustrated, I went to operate the switches from the driver door. All of the sudden the up and down is now back to normal for the repaired window. I went to the rear driver side door again to operate the switches and it functioned normally. Like I said, voodoo. 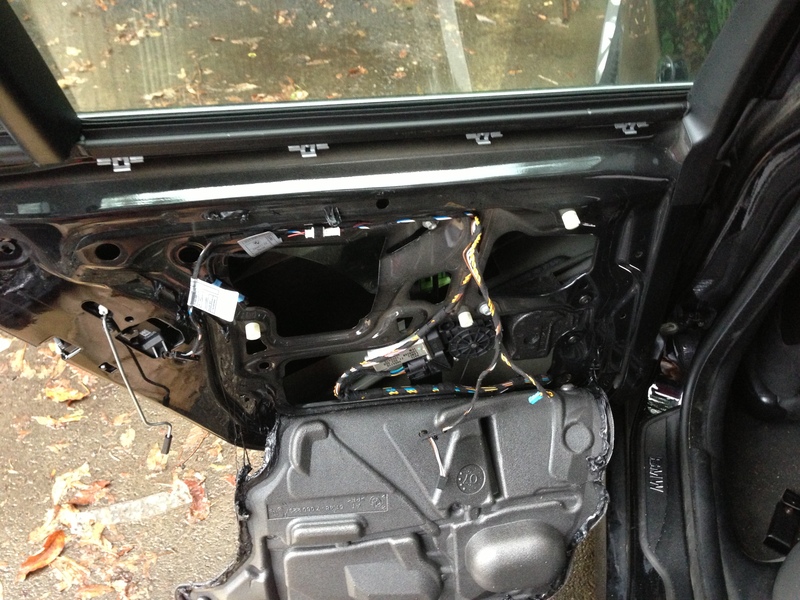 Now that the window works, the rest of the process is to put the door sound insulation back on. Before mounting the door panel back on ensure that all of the switches are plugged back in and that the door lock mechanism is mounted properly. When the door panel has the lock switch aligned and all the wires hooked up again, align the door panel’s ribbed rivets to the holes in the door frame and give it a firm push around the perimeter. 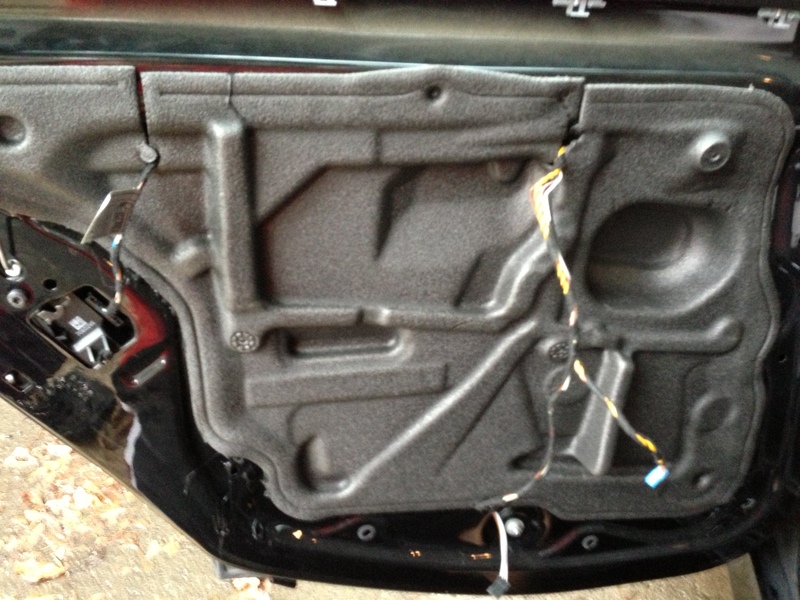 You can wrap up by securing the three torx screws back on and placing the trim pieces on the panel. Once you’re done, give the window and the rest of your car a good wipe down because you’ve probably smudged up the glass pretty well at this point.